And down for the count. Before my West Wing nuttiness (which is only sort of resolved. Ugh), I did do a lot of knitting, but I also did a lot of sitting around moaning in pain. Let's hope that this migraine is the migraine I'll get for the months of August and September, and I can honeymoon free of blinding pain and nausea. But! Le knitting! 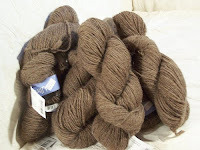 I went shopping and did a little stash sorting and, well, I have a lot of yarn. Maybe not a lot by the definition of some knitters, but a lot for me where the space for the stash consists of what little room I have on the floor of my closet. So while I want to buy yarn (I always want to buy yarn), I cannot because I simply do not have the space. 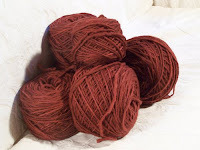 And I cannot buy yarn until I have knit what I have. This will be Cobblestone. 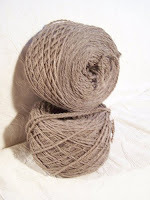 In the spirit of knitting Dave a sweater every year for Christmas, Cobblestone is perfect. 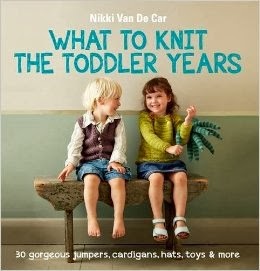 And then I don't know what I'll knit next year. The ranks of sweaters-for-men are a little too cable-y for Dave's (well, my) taste. Tralala, I will knit a dress. I have wanted to knit a dress for some time, mostly so I can say, I had the stick-to-it-ness to knit a dress. 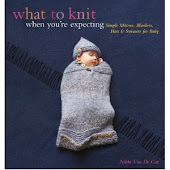 But I thought, for my first dress, I should knit something on largeish needles. I will knit Luna Dress. It will look smashing. I am wearing this right now, but haven't taken the photo yet. It is comfy and fun and awesome and knit up in all of two days. (Granted, the migraine may have helped with that. As did the Size 19 needles). And it has been at the top of my queue for a year now. I'm just knocking off that entire Fall '07 issue of Interweave. I confess, I totally stole this idea from Kelk. 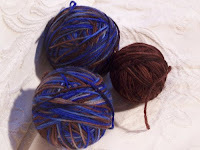 I loved her brown-and-pink Monkeys with the brown heel, and now I want to make blue-and-brown Monkeys. I get the feeling hers will look better. Bruise = not exactly what I was going for, and not particularly flattering. At all. I've, ahem, had to put aside the tunic with the long name. I ran out of yarn, but more importantly, I don't think it's going to fit the way I want it to. Which is sort of depressing, given the Fitted Knits ethos and all. I want it to be longer, I want it to be a little more roomy around my hips, obviously I need more yarn, but good god, I'm not sure I can knit this boring freaking thing all over again. It's in time out until it can prove its worth. But I'm still not giving up on Fitted Knits--I just think I'm going to have to try a pattern where the pattern itself interests me as much as the finished object. So--Cascade Ecological, you shall one day be Textured Tunic, aka the other tunic with the long name. There's, um, more yarn in there somewhere, but I have plans for all of it too (lots of socks, lace ribbon scarf, one day maybe a Shopping Tunic ripoff.) 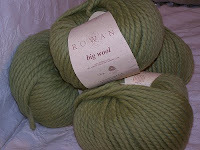 But these are the ones that I have to knit before I can buy more yarn. Trouble is, self-imposed rules are easily broken.